Creating a Vintage Style Christmas and a Linky Party! I am starting the party off today with my collection of vintage Christmas figurines! This grouping is situated on top of my vintage washstand along with an old vanity mirror, a vintage Christmas tea towel, a mismatched snow village, and a couple of ceramic trees, one with a tea light at the rear. Starting on the left is a Holt Howard Santa on a sleigh, with a Napco Mrs. Santa shaker, and a vintage unmarked deer figurine is in front. This is a "married" grouping. Mrs. Santa is missing the other shaker, the Holt Howard Santa is missing his original large white reindeer, and I'm not sure if the deer was originally part of a set or not. I'm not all matchy-matchy, so this works for me! These figurines are from the 1950's and 1960's. These adorable little angels are all made by Lefton in the 1950's. These two sets are my favorites. The little deer is also vintage. Maker unknown, but likely made in Japan. Moving over to my desk's hutch, I have two "made in Japan" Santa candle holders that I have displayed with bottle brush trees. The Waechtersbach holly bowl is filled with snowballs made last year, and posted to my blog. The taller figurine with the packages was my Mom's, and I remember it from my childhood. More mismatched snow village houses that I painted white in 2011, a little unmarked angel with a tree, and another pug dog. This is the right side of the desk hutch. This little pair of angel figurines is marked Japan, and the gold candle salt and pepper shakers are unmarked with cork stoppers. This angel is another of my favorites. I love her eyelashes. Maker unknown. The center shelf of my desk hutch. These little charmers on the left side of the hutch are salt and pepper shakers. The little angels in front are marked Japan, and the other set is made by Napco in 1956. The set of deer are unmarked, and the sleigh is from the early 80's made by Lefton. This hutch works well for displaying my Christmas figurines. This Santa figural planter I purchased thrifting last winter is also unmarked. This little lady is the only Christmas head vase in my collection. This Santa and his reindeer were mine as a child. They are made by Columbia Toys, copyright 1959. Plastic faced stuffed animals were popular when I was a child. 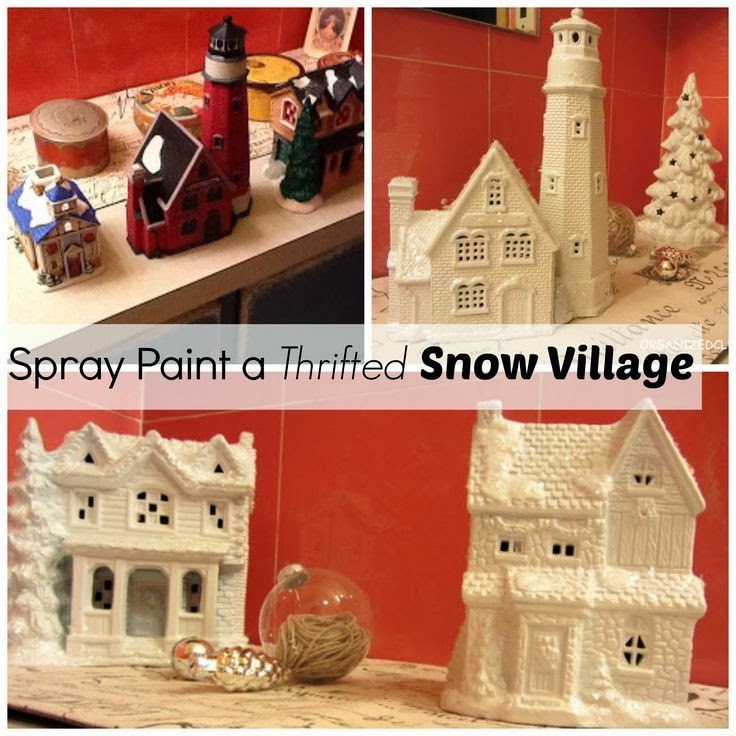 If you are a baby boomer, you might remember some of these vintage Christmas pieces! Be sure to join the other Creating Christmas party hosts. Please link up any of your vintage style Christmas posts below! 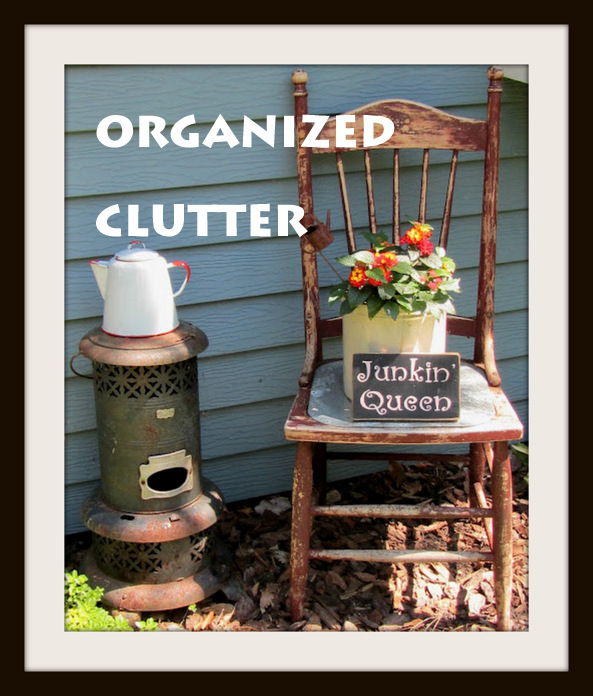 What great vintage goodies, Carlene! I LOVE the Holt Howard Santa...that face!...and of course, every home needs a pug! Carlene, I love your collections! The Leftons are just precious. The Santa and reindeer from your childhood is such a treasure and I adore all of the little reindeer! Thanks so much for joining in this party. I'm sure more links will show up soon! Love your Howard Holts and Leftons and especially the Christmas Head Vase. I have one Christmas Head vase and she also gets to share a bunch of holly. Thanks for hosting Creating A Vintage Style Christmas. Have a wonderful week. You have some really cute pieces, I really enjoyed looking at them, the Lefton ones are always so sweet! LOVE this! Honestly I love all Christmas decorations, but this is very cute, great job! O my....this is an AWESOME collection. You really started this party week off great. Thanks so much for sharing all these and for hosting this party. Your figurine collection is just adorable. love those little singing angels. I remember my grandmother having some of those when i was little...long time ago! Hi, there! First time here- I think! Love your little displays. I've been having so much fun with mine. You have an amazing collection! I have Christmas Lefton angels but not sure I am bringing them out this year. Trying to keep it simple this year, but I already really miss them seeing your pretties! Thanks for hosting. You know I had to join this party. Thanks so much for hosting it. Merry Christmas!! All your vintage Christmas collectibles are so cute. Love the sweet Santa on the sleigh! You have some wonderful vintage Christmas items. Thank you for hosting! Wonderful collection. I am joining the party- Jann Olson suggested I link up! Love the Lefton angel figurines. I think I may have a couple and was going to make a blog post showing them! As soon as I do I'll add them to the party too! Oh your collection is wonderful! I linked up to the party this week. Thanks for hosting. I love all your vintage Lefton's they are absolutely too cute. Thanks for starting the party off. Love all the vintage. Oh, what a collection you have. Thanks for hosting the party. 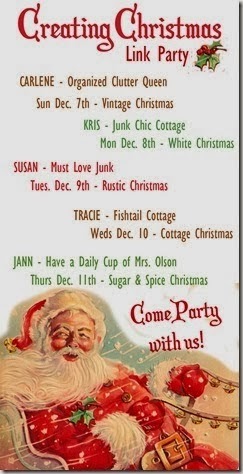 I can't wait to see Kris Junk Chic Cottage. love your collection of little girls! I have some Lefton Christmas Angels and they are so sweet. Having trouble taking photos as we have had no sunshine for days! Wow! It's just so charming, happy, and nostalgic that one can't help, but smile. Love it! I love all your Christmas figurines Carlene, especially that sweet little set of unmarked deer. This is my kind of party. So much wonderful vintage inspiration. Thanks so much for hosting! Your little "scenes" are wonderful! I also collect vintage figurines from Napco, Lefton, Holt Howard, etc. and have worked several days trying to figure out how to display them. Ta daaah! Found your blog! Thanks very much, you've given me some great ideas!